Tag Archive | "Scotty Hazel"
Scotty Hazel, a teacher at Cedar Springs for 20 years, was loved by his students for his encouraging, selfless, and giving attitude. That legacy has lived on, even after his death last month from cancer. 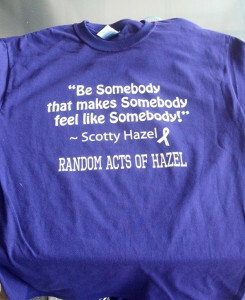 Soon after his death in July, a Facebook page was created called “Random Acts of Hazel.” The intent is to honor Hazel by performing random acts of kindness and dedicating them to him. The page already has over 3100 members, and countless acts of kindness have been chronicled there. They even have t-shirts for sale that will benefit the Hazel children’s college fund. 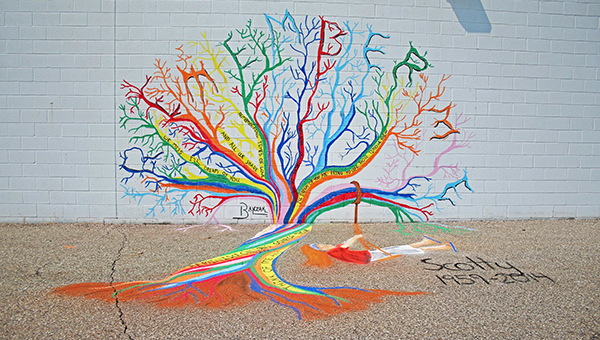 One Cedar Springs grad honored Hazel last weekend by creating a beautiful tree with chalk art. One of Hazel’s poems, Remember Me, is written in the tree. Justin Balczak, a 2011 graduate, spent 12 hours bringing the tree to life on the side of the Edward Jones business in the strip mall on 17 Mile. You can see the whole process on YouTube by going to https://www.youtube.com/watch?v=FJahTq0ceFA. The random acts of kindness that people have performed are reaching everywhere. Some of the messages on the page are being left by people who experienced a Random Act of Hazel. Another woman wrote that she was buying groceries in Grandville, and had left her debit card at home. The woman behind her told her she wanted to pay for her groceries, as a Random Act of Hazel. A family from Holland, Michigan heard about Random Acts of Hazel and decided to come to Cedar Springs after church Sunday to see the chalk art tree. They spent time in both Cedar Springs and Rockford, picked up some RAH t-shirts, a copy of Hazel’s book, and then performed some Random Acts of Hazel in Grand Rapids. “It was lots of fun to pop quarters in candy machines to give others a free turn, play some arcade games and then give the tickets to a young boy to turn in, and tip our servers a little extra and tell them we greatly appreciated their service. It will be fun to continue to think of ways to bring a smile to the faces of others. I’m looking forward to reading his book and seeing more about the kind of man he was to leave such a legacy behind,” she said. T-shirts with encouraging sayings from Scotty Hazel can be bought at Main Street Restaurant in Cedar Springs, and Aunt Candy’s Toy Company in Rockford. To read more about the Random Acts of Hazel being performed, search for Random Acts of Hazel on Facebook. More than 1,500 people gathered in the Cedar Springs High School gym last Saturday night for a basketball game between past and present Detroit Lions and Team Hazel, a group of community members who have come together to show their support of Cedar Springs High School teacher and soccer coach, Scotty Hazel. Hazel is undergoing treatment for liposarcoma. This is his second fight against cancer. The event raised $12,500 towards Hazel’s cancer treatments. The fundraiser was the brainchild of former CSHS teacher Cliff Young. The event featured several Detroit Lions players, including Rob Rubick, Herman Moore, Bill Bentley, Cory Schlesinger, Devin Taylor, and Tahir Whitehead. They played against a team made up CSHS teachers and community residents, including MSU standout and CSHS grad Austin Thornton. But the game was strictly for fun—full of hijinks, laughs and special substitutions from the sidelines. During halftime, the players signed autographs, and residents had the chance to bid at a silent auction. Young said the event greatly exceeded his expectations, both in attendance and in the amount of money raised. “Rob Rubick, who runs the Lions team, said it was the biggest and most raucous crowd they have played for,” noted Young. On Saturday, May 3, at 7 p.m., current and former Detroit Lions football players will take on local members of “Team Hazel,” a group of community members who have come together to show their support of Cedar Springs High School teacher and soccer coach, Scotty Hazel. Hazel is undergoing treatment for liposarcoma. This is his second fight against cancer. 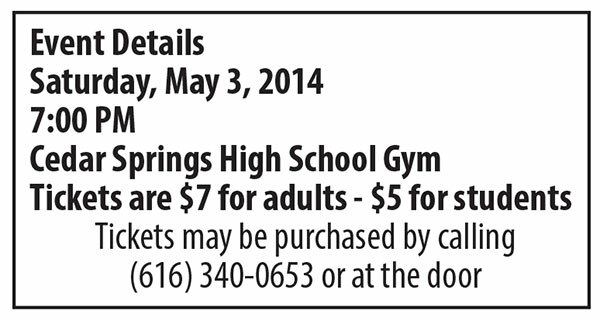 The game will be in the Cedar Springs High School gym. Tickets are $7 for adults and $5 for students and may be purchased at the door. Half time will feature player autographs and a silent auction. More than 700 tickets have already been sold to the “Team Hazel versus Detroit Lions” game. A large portion of ticket sales have come from the students he’s inspired over the years. The public outpouring of support is evident on the “Purple Haze Page” on facebook. It has more than 1,700 members. Herman Moore, 11-year NFL WR and 4-time Pro Bowler. He is currently the Lions career leader in receptions, receiving yards, and touchdowns. Bill Bentley, a second-year CB out of Louisiana-Lafayette. He was a third-round draft pick in 2012 and has over 40 tackles in his short career. Rob Rubick, a 7-year NFL TE and Grand Valley State University football standout. He now does color commentary and broadcast work for the team. Devin Taylor, at 6’ 7” and 270 lbs. this DE is a player to watch. Theo Riddick, former Notre Dame star for coach Brian Kelly, figures to see a lot of action this year at both WR and KR. Tahir Whitehead, a second-year LB and special teams standout. Last year, he won the Yale Larry Special Teams Most Valuable Player Award, recording nine tackles and a forced fumble. Local players include many Cedar Springs teachers, residents, and alumni, including Austin Thornton, a former member of the MSU basketball team. The event will be announced Trey Reed, another Cedar Springs graduate. If you would like to make a donation, make checks payable to Cliffton Young and mail to 6487 Blythefield Ave NE, Rockford MI 49341. All funds will be deposited into a special fund set-up for Scott Hazel at Lake Michigan Credit Union. More than 600 tickets have already been sold to the “Team Hazel versus Detroit Lions” game to benefit beloved Cedar Springs High School teacher and soccer coach Scotty Hazel. On May 3, at 7 p.m., at Cedar Springs High School, current and former Detroit Lions football players will take on local members of “Team Hazel,” a group of community members who have come together to show their support of Scott, who is undergoing treatment for liposarcoma. 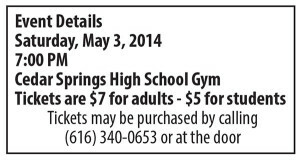 Tickets are $7 for adults and $5 for students and may be purchased at the door or by calling (616) 340-0653. A large portion of ticket sales have come from the students he’s inspired over the years. The public outpouring of support is evident on the “Purple Haze Page” on facebook that was created to provide regular updates from Hazel and encouraging thoughts from friends. It has more than 1,700 members. 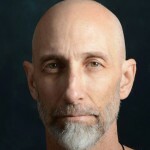 “Scott is that teacher who is equally loved and admired by teachers and students alike. He’s given an incomparable amount of positive dedication to this community over the years. I’m so glad we have an opportunity to give back to him,” says event organizer and former Cedar Springs teacher, Cliffton Young. Come out and show your support Scott Hazel and enjoy a great game!